We are so excited to be offering a spring delicacy that we have never before grown at Brickel Creek this year: green garlic! While I am certain that you are all familiar with the mature, cured version of this tasty treat, we hope that you will try its slightly less mature form! Green garlic features a milder flavor than mature garlic, and is certainly a spring flavor to look forward to every year. Green garlic (also called young garlic or spring garlic) is simply garlic that hasn’t fully matured. Green garlic and garlic scapes are not the same thing. Green garlic is harvested young before bulbs develop or dry out, whereas garlic scapes are the flowering stalks of the mature hardneck garlic — an indicator that the garlic bulbs are ready to be harvested. Green garlic has a more mild flavor than mature, cured garlic, and the entire plant is edible! Green garlic should be stored in the refrigerator, where it will keep for 5-7 days. Wrap the green garlic in a damp paper towel and place it in a plastic bag; or for a non-plastic alternative, stick the green garlic in a tall glass with some water in the bottom. To prep, trim off the very bottom of the bulb and use all of the tender white and light green parts. Dark green leaves can be saved for stock, or used to add flavor to a soup (pop them in whole, like a bay leaf). Many thanks to Alanna, of The Bojon Gourmet, for allowing us to share her wonderful recipe for an incredibly fresh, seasonal variation of classic asparagus soup. The cooking method described below preserves the green hue of the soup; if you prefer, you can skip the blanching and cooling steps and simply add the asparagus with the water and potato. I think fat asparagus stalks tend to be more meaty and creamy, and make the best soup, but any tasty, in-season asparagus will do. Feel free to garnish the soup with chives, chervil, tarragon or cilantro; see the post above for more ideas. Fill a pot with 2 quarts of water and bring to a boil. Snap the woody ends of the stems off of the asparagus spears and discard; they will naturally break at the right spot. Keep the heads in tact and slice the stems. Blanche the asparagus in the simmering water for 1-2 minutes, until bright green and crisp-tender. Strain through a colander and into a large bowl, reserving the asparagus water. Rinse the asparagus under cool water to stop the cooking, and set aside. Trim the root ends off of the green garlic and leeks. Slice the green garlic (leafy green parts included) crosswise into thin rounds, and place the rounds in a large bowl. 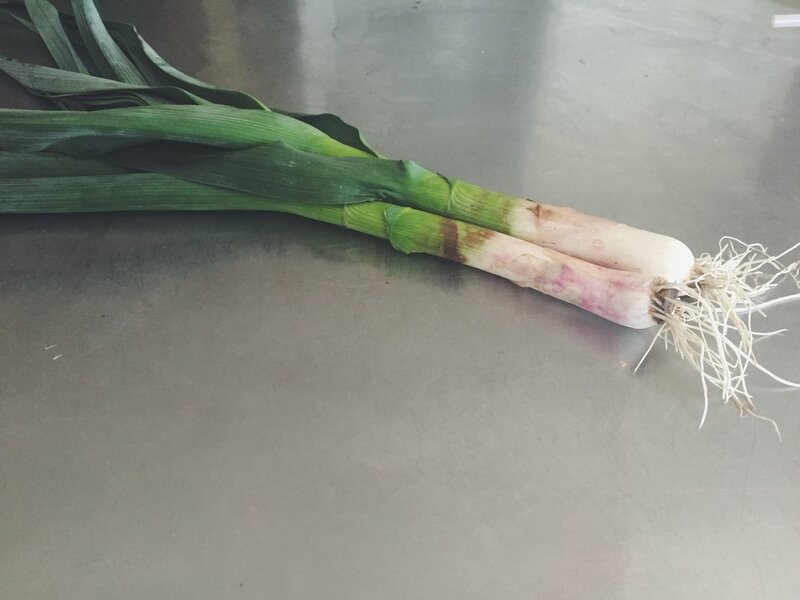 Slice the leeks in half lengthwise, then slice the white and light green parts crosswise into 1/4″ thick half-moons. Place the sliced leeks in the bowl with the green garlic, fill with cool water, and separate the rings, swishing occasionally as they soak to release any sandy dirt, which will sink to the bottom. Scoop the leeks and garlic out of the water (you can repeat the soaking/scooping process if the leeks are super dirty), drain them in a colander and give them a final rinse. Melt the butter and olive oil together in a soup pot or dutch oven over medium heat. Add the leeks and green garlic and saute until bright green and tender, 5-10 minutes. Add the salt, potato, and enough of the reserved asparagus cooking water to cover the vegetables, 4-6 cups. Bring to a boil, then cover the pot and simmer until the potato is very tender, 10 minutes. Add the asparagus, reserving several pretty heads for garnish, and puree the soup with an immersion blender, or in batches in a regular blender, thinning with more asparagus water as needed. Stir in the juice of half a lemon, taste for salt, adding more salt or lemon as you see fit. Meanwhile, stir together the yogurt and lemon zest. Re-warm the soup, and serve in bowls with a dollop of lemony yogurt and a couple of asparagus tips. The soup will keep in the fridge for up to three days. Recently, we have had many inquiries about purchasing produce directly from our farm. We don't operate a traditional farm stand. However, we do take orders for pick up at the farm at a scheduled time. If you would like to sign up to receive our seasonal pick list with pricing, as well as occasional news and updates about our farm, please fill out the form below. We look forward to serving you! Sign up with your email address to receive our seasonal pick list, news and updates. We respect your privacy, and will not share your information. Don't forget to follow us on Instagram and Facebook for a peak at daily life on the farm, as well as information about weekly deliveries!